An incredible collection of work – music from a relatively short period in the long career of alto sax legend Ornette Coleman – but one that still may well represent his creative high point! Ornette's unusual sound and group style had already been brewing for a few years before these sides – but at Atlantic Records, the reedman really locked into gear – exploring his new sense of rhythm and timing with the legendary lineup that included Don Cherry on cornet, Ed Blackwell on drums, and Charlie Haden on bass – a group that many still try to rival all these many decades later! The core combo are at the heart of most of the records here – which also include later Atlantic issues of recordings from the sessions of the early 60s albums – but Coleman also explodes on tenor on one record, and launches into his album-length improvisation on the Free Jazz classic – an album that gave a name to a genre to come. 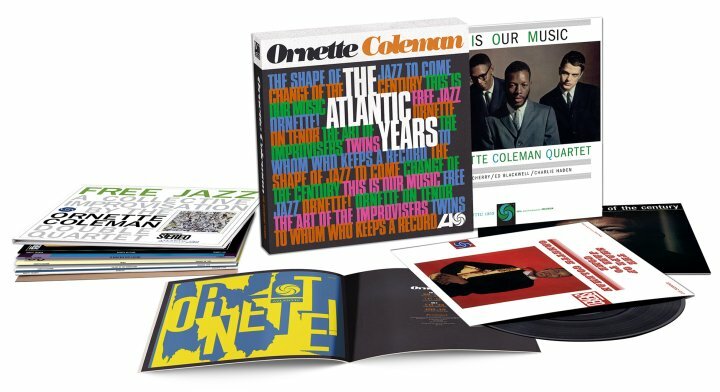 The box features the full albums Shape Of Jazz To Come, Change Of The Century, This Is Our Music, Free Jazz, Ornette, Ornette On Tenor, The Art Of The Improvisers, Twins, To Whom Keeps A Record, and The Ornette Coleman Legacy – the last of which features rare recordings, on vinyl for the first time. All albums are on 180 gram vinyl, with vintage-style tip-on jackets – and the whole thing is beautifully put together. © 1996-2019, Dusty Groove, Inc.